U.S.: Satellite Images Show Russian Rockets Hitting Ukraine : The Two-Way The State Department says the photos show burn marks from the firing of multiple rocket launchers inside Russia and resulting craters on the other side of the border. An image released by the U.S. State Department shows what it says is evidence of Russia firing artillery into eastern Ukraine. Update at 4:05 p.m. ET. The U.S. State Department has released satellite images it says back up the assertion by Washington and Kiev that Russian forces are firing artillery into eastern Ukraine in support of separatists. In a four-page document titled Evidence of Russian Shelling into Ukraine, released Sunday, blast marks from rocket launches in Russia and craters in Ukraine can be seen, the State Department says. The document also shows "self-propelled artillery only found in Russian military units, on the Russian side of the border, oriented in the direction of a Ukrainian military unit within Ukraine." It also states that: "Russia-backed separatists have used heavy artillery, provided by Russia, in attacks on Ukrainian forces from inside Ukraine." The images are attributed to the U.S. Director of National Intelligence and were taken between July 21 and July 26, officials say — days after the downing of Malaysia Airlines Flight 17. According to The Associated Press, they "claim to show multiple rocket launchers fired at Ukrainian forces from within Ukraine and from Russian soil. 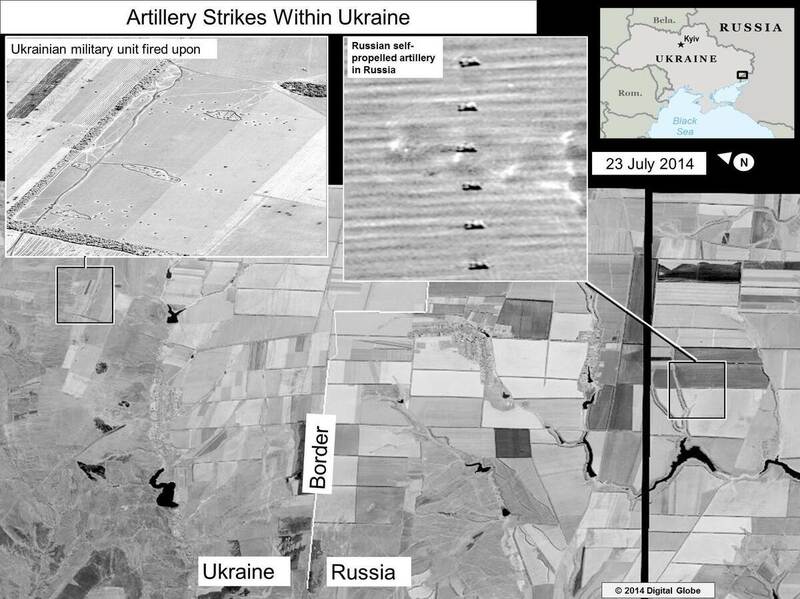 One image shows dozens of craters around a Ukrainian military unit and rockets that can travel more than 7 miles." The release of the satellite images comes after the U.S. said last week that it had obtained "new evidence" that Russian forces were firing artillery across the border, a charge that Kiev has made repeatedly and loudly in recent days. It also comes as Russian Foreign Minister Sergei Lavrov and U.S. Secretary of State John Kerry reportedly agreed in a telephone conversation Sunday on the importance of a cease-fire in eastern Ukraine, according to Reuters. In a Russian Foreign Ministry statement carried by the news agency, Moscow describes the crisis in Ukraine as an "internal conflict." A readout of the conversation issued by the State Department says Kerry "urged Foreign Minister Lavrov to stop the flow of heavy weapons and rocket and artillery fire from Russia into Ukraine, and to begin to contribute to deescalating the conflict." The secretary of state "did not accept Foreign Minister Lavrov's denial that heavy weapons from Russia were contributing to the conflict," it said.